Hoary cress is a perennial plant that grows up to 2 feet tall. It reproduces by seeds and from a deep, spreading root system. Plants begin growth early in the spring with leaves that are grey-green in color with short stems. The leaves are longer than wide, with rounded tips and smooth to slightly toothed edges. Stem leaves are alternate and clasping. Plants bloom in the spring. The flowers are small, and white with four petals, arranged in dense, flat-topped clusters. Seeds are produced in heart-shaped pods, with each pod producing two reddish brown seeds. Type and Class of Livestock: Sheep and goats; considered mildly toxic to cattle. Grazing Objective: The objective is to prevent flowering and maintain removal of 85% of top growth during the growing season. Growth Stage for Treatment: The best time to graze is before flowering. Palatability is considered to be low for all classes of livestock, and decreases rapidly as plants bloom and mature. As with all deep-rooted perennial plants, the treatments would have to be repeated at least two times per year. Literature indicates at least three years of grazing is necessary to reduce populations of hoary cress. Grazing hoary cress is considered impractical because of low acceptance by livestock and the potential for poisoning. Potential Effectiveness: Sheep and goats will consume hoary cress more readily than cattle. 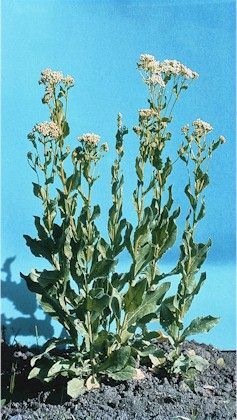 Cattle will consume hoary cress but, glucosinolates in large quantities may be toxic. Little information is currently available on the effectiveness of targeted grazing of hoary cress. Surveys and literature disagree on the potential of controlling hoary cress with grazing because of palatability and toxicity issues. However, repeated grazing may reduce plant vigor and flower production. Chipping, D. and C. Bossard. 2000. Cardaria chalepensis (L.) Hand-Mazz. and C. draba. In: C. C. Bossard, J.M. Randall and M.C. Hoshovsky [EDS.]. Invasive plants of California’s wildlands. Berkley, CA: University of California Press. p. 80-86. McInnis, M.L., L.L. Larson and R.F. Miller. 1993. Nutrient composition of whitetop. Journal of Range Management 46:227-231. McInnis, M.L., L.L. Larson, and R.F. Miller. 1990. First-year defoliation effects on whitetop (Cardaria draba (L.) Desv.). Northwest Science 64:107 (Abstract). Sheley, R. and J. Stivers. 1999. Whitetop. In: Sheley, R.L. and J.K. Petroff. [EDS]. Biology and management of noxious rangeland weeds. Corvallis, OR: Oregon State University Press. p. 401-407.